Never get stuck with dry pasta again! 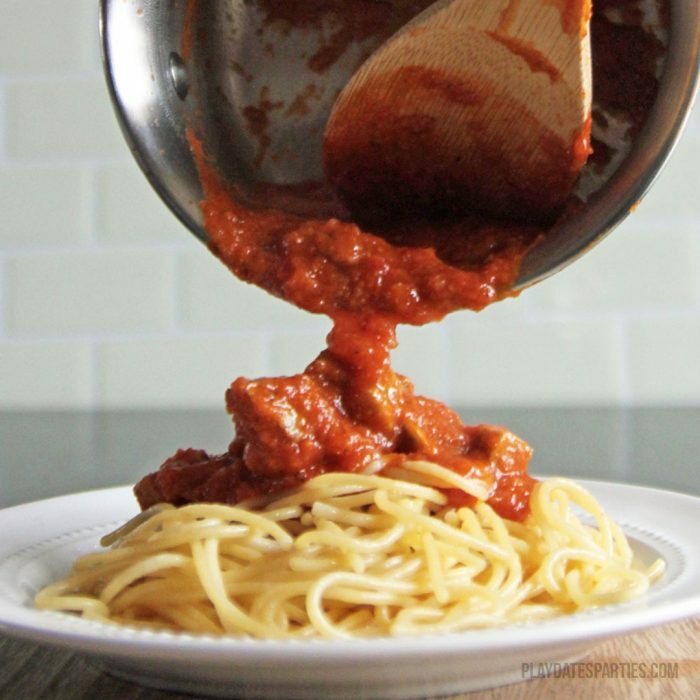 Try these six tips to stretch jarred pasta sauce so that it can cover a full pound of pasta…and taste just like it was homemade. Have you ever looked at how many servings are in a jar of pasta sauce and compared it to the number of servings in a pound of pasta? They’re not remotely the same. Jarred sauce usually has 5 to 6 servings per container. Pasta is usually sold by the pound, which serves 8. If you do the math, it will take 8 jars of pasta sauce and 5 pounds of pasta to get equal serving sizes. What family needs to make that much pasta for a regular family meal? Ours doesn’t, that’s for sure. Then, there’s the fact that our family loves LOTS of sauce on our noodles. For us, it’s all about the sauce, and more is pretty much always better. Now, our favorite is always our homemade, veggie-filled sauce, but as school and extracurricular schedules get busier, it gets more and more difficult to find time to make sauce from scratch. And I’m not ashamed to say that I keep a jar of sauce on hand for emergencies. But with 5 hungry mouths to feed, I need to find a way to stretch that 5-serving jar to cover a full pound of pasta. Thankfully, I’ve found a few tricks that I like to use to not only stretch that jar of sauce but to make it taste infinitely better than it does straight out of the jar! Don’t throw away vegetables anymore! While the water is starting to boil, chop up any aging veggies and sauté them in the sauce pot with a little oil before adding the pasta sauce. They should be just soft enough to poke them with a fork. Then let the sauce do the rest. Throw in ground beef or mild Italian sausage. I like to cook ground beef with some onion and garlic before adding the sauce right on top. If we’re using Italian sausage, I’ll squeeze it out of its casing before cooking to get a nice crumbly texture. Many will tell you that you should always add a little pasta water to your sauce to help the sauce bind better to your noodles. I tried it first about a year ago, and have been a convert every since. Serious Eats did a fantastic article testing the theory. While your noodles are boiling, start heating your sauce in another pot. Set the jar aside, but don’t throw it out. When the noodles are finished, use a metal or glass measuring cup to pull about a cup of water out of the pasta pot. Set the water aside for a couple minutes to cool. When the water is warm, but not steaming hot, pour it into the pasta jar. Replace the lid and gently shake the jar to loosen any sauce stuck to the sides of the jar. Pour the mixture into your sauce and stir to combine. Long before ever starting this blog, I had to make dinner for a banquet of over 100 hungry men. And, since this was a charity event, we were on a strict budget! BUT, buying lots of pre-made jarred pasta sauce can get pricey fast. And my trusty homemade pasta sauce recipe wouldn’t make enough for this large crowd. After some thinking, I decided to stretch jarred pasta sauce with a few cans of plain tomato sauce. After the event, the Husband came home and told me that the pasta was met with rave reviews and several requests for the recipe. 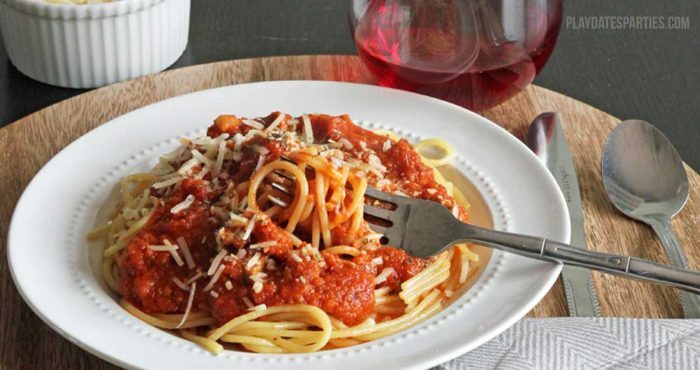 Red wine is fantastic for adding depth and dimension to pasta sauce. I prefer stronger wines for our sauces, such as bold Merlots, Zinfandel, or Cabernet Sauvignons. These will add more flavor than lighter wines like Pinot Noir and Shiraz. But if you really want to get the best flavor, combine this with a little bit of meat or Italian sausage and the flavor will be out of this world. My favorite time of year to stretch jarred pasta sauce is in the summer. That doesn’t mean I stop using leftover vegetables in the winter. I’ve been known to add cooked green beans, kale and spinach to our sauce. Usually, everything turns out very well. Just remember to blend everything together. If you have picky eaters, an immersion blender is your best friend. Go ahead and add your veggies to the sauce, but blend them up so the kids have no idea that they’re getting a few extra nutrients with their favorite dinner. Dark greens like spinach and kale will drastically alter the color of the sauce. No amount of blending can cover it up, but it should still taste good! Make sure to taste your sauce as it’s cooking. Adding raw vegetables, water, or plain canned tomatoes may thin the sauce, and make it too bland. If this happens, feel free to add in spices such as powdered garlic, powdered onion, Italian seasoning, basil, oregano, and sometimes a little bit of salt too. Blend in some leftover cooked vegetables. Best of all, your pasta will come out more flavorful, and your wallet will be lighter. It’s a win every way around! Yes, the Serious Eats article talks about doing that too. I’ll definitely have to try that next time. And, yes, this is definitely one of the ways I get extra veggies in my picky eater. Aww! Glad to know I’m on the track of someone’s grandmother! That’s a sure sign of something good! You are brilliant! The pasta to the sauce one. I never knew that! Did you know that I pin pretty much every post you write? Fantastic! That is one of the nicest things I’ve ever heard! Thanks so much for being such a great and supportive friend, Jen! I think I’m going to try some red wine in mine…because wine, obviously! Haha! No, we had no idea that we were both posting about spaghetti. And no, I won’t tell your kids. I don’t tell my own! ? Definitely try the red wine, it’s fantastic. I can pour in red wine! Totally doable. I definitely recommend adding some. It doesn’t take much, but really changes the flavor profile. Great ideas! We rarely need more sauce on spaghetti nights since I have two boys that like very little sauce but I find that I never have enough sauce when making lasagna or a baked pasta dish– this is brilliant! I wish our kids were like yours. We’re 100% a sauce family…we all like it to practically be swimming. I blame my Italian heritage. This is a perfect way to bulk up sauce for baked dishes, too. oh wow these are awesome tips! I don’t think I’ve ever finished a jar unless I was making a casserole of some sort. What can I say, we’re sauce lovers! These are all really great ideas! Love it – thanks for sharing. I really like pasta sauce with tomatoes, so that’s one I could easily do. Hi Leslie, every little helps. Adding veggies or a tin of tomatoes is a good way of making sauce go a bit further and adding goodness at the same time. Adding veggies to our pasta sauce is my favorite way of sneaking a few extra veggies into our girls’ diets. Plus, it makes the flavor so much better! Thank you for the great suggestions to stretch the jar of pasta sauce. As you pointed out, the serving sizes never match up properly and we always end up with left over this or that. Normally…we don’t have enough sauce. 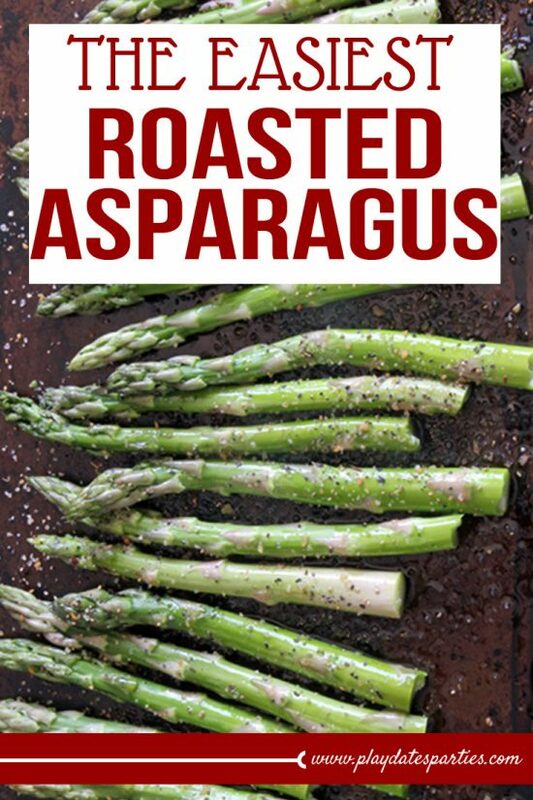 I love the idea of using vegetables to make it stretch. Thank you for sharing! What is it with the sauce to pasta ratio in packaging! I’m pretty sure that pasta sauce jars are at least a full serving less than they used to be. I hope these tips help your family out! Pasta without enough sauce is just a sin. 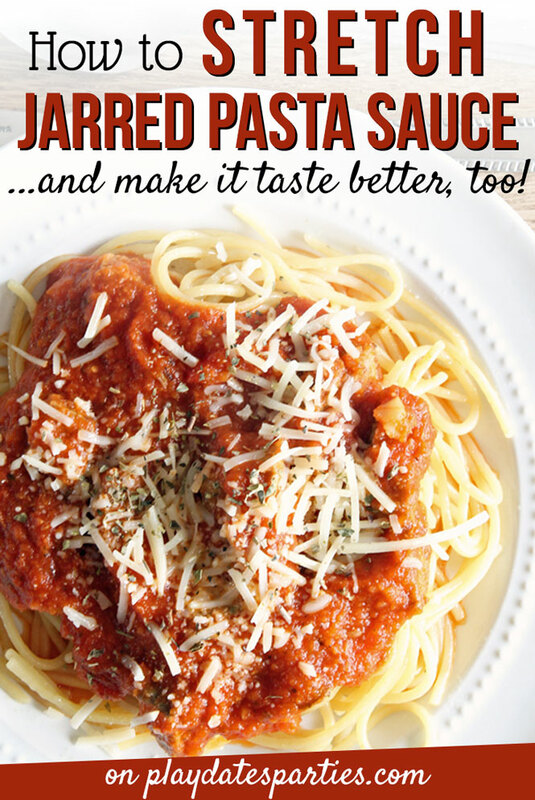 This stretch jarred pasta sauce sounds so delicious, Leslie! I am always looking for some new pasta sauce recipe! Thanks Agness, I hope this helps you! I’ve got a idea to take your great ideas to a whole new level. The night before brown some ground beef & onions., refrigerator till morning, then dump ground beef mixture, jar of your favorite Spagetti Sauce, 28 oz Can of tomatoes, 28oz can of Tomatoe Sauce,, about t basil, oregano and maybe even a splash of that Red Wine you recommend INTO THE CROCK POT for the day ………….. OMG Best Sauce Ever !!! Doesn’t even taste like Jared Sauce anymore because you just used it as a base. It makes a TON of sauce for a second meal or freezing !!! I thought I was just not cooking the pasta right all this time. 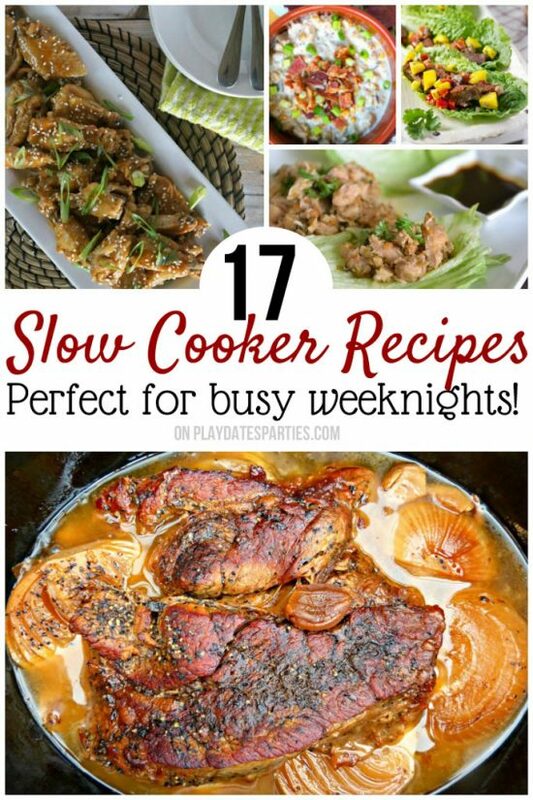 We always “doctor” the jarred stuff – it’s great when you don’t have time to cook. Thanks for sharing at the What’s for Dinner party – have a wonderful week! I usually try to make our own pasta sauce, but I’ve never tried it with some of these vegetable combinations. Pinning to try, and also adding it to The Really Crafty Link Party Pinterest board. Thank you for sharing. These are great tips. Thanks for sharing on Sunday’s Best. Great and simple suggestions! I do love adding extra veggies in just so my kids actually eat them. LOL. Delicious!! My mouth watering. Thanks for sharing!! These are great tips–I’m definitely going to try adding pasta water to my sauce next time and I love the idea of using up extra veggies by adding them too. I hate having to throw out veggies because we didn’t get around to eating them! So many options here and I’m down for all of them! YES! we have teen boys and i ALWAYS need to stretch sauce homemade or store bought! Shared and pinned! 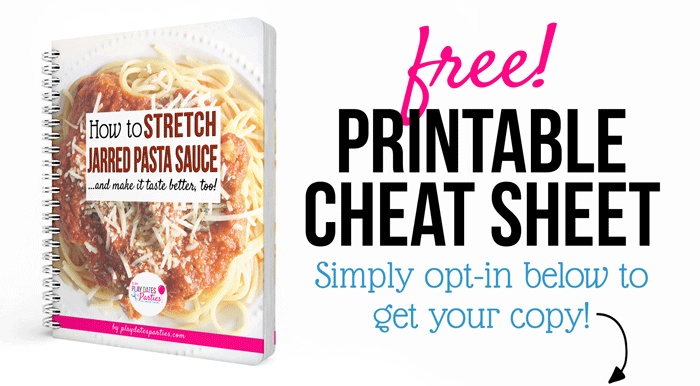 Hi Leslie, great ideas for making that spaghetti sauce stretch! And I love the idea of adding the veggies to create an even healthier sauce! Thank you for sharing at Party in Your PJ’s! Great ideas! While I love making pasta sauce from scratch sometimes time is an issue and improving a jar of pasta sauce is a great solution! Thanks for sharing your post on the Simple Homestead Blog Hop, as one of the co-hosts I will be featuring your post this week!